When attending live theatre, I expect to learn something new in addition to being entertained. There are so many stories begging to be told through the magic of Broadway and there hasn't been a more diverse group of storytellers than the 2015/2016 season. We're six months away from the 70th Annual Tony Awards and it is already clear that the telecast will be a true celebration of diversity on the Great White Way, both on and off stage. This season's productions of 'Hamilton' and 'Spring Awakening' are arguably the two most diverse shows that Broadway has ever seen. 'Hamilton' almost exclusively features actors representing all minority races in America. 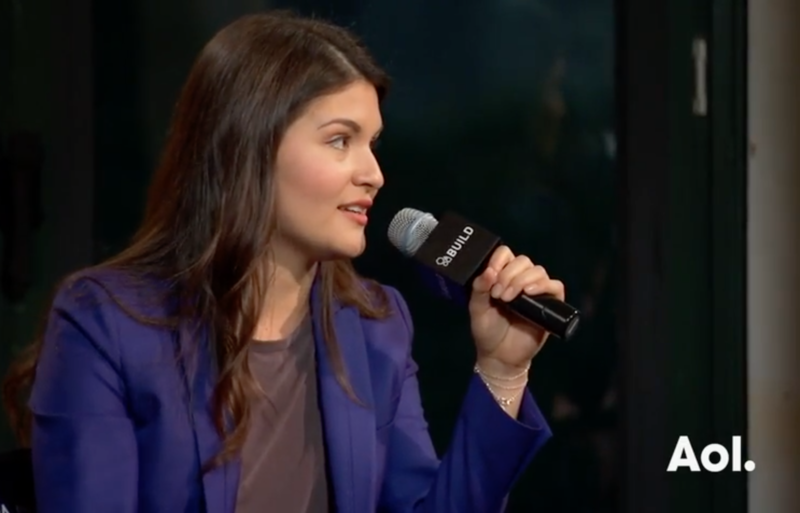 Phillipa Soo, who plays Elizabeth Schuyler-Hamilton in the production, stopped by AOL Build to discuss what it means to make her Broadway debut in a show that is selling out every performance. After helping to analyze the story of her character and describe the creative process, she realizes that "there is something magical about the theater that you can't experience anywhere else." Having actors representing minority races allows the audience to be told a story of the past America by present America, which is often seen as a melting pot of people. The show speaks to people of all demographics, and that explains why 500 people show up to the daily ticket lottery drawing. While not all of us can relate to Alexander Hamilton's story directly, we can relate to the musical because there is someone on that stage that represents a positive part of who we are in terms of race and gender. All principle roles are, and will continue to be filled by actors of non-white ethnicities, with the exception of the role of King George III. 'Hamilton' provides an opportunity for people of minority races to have a chance become a strong representative of their respective ethnicity, which is something that is not commonly found on Broadway. 'Spring Awakening' first came to Broadway in 2007 and launched the superstar careers of 'Glee' star Lea Michele, Broadway's Jonathan Groff and 'Pitch Perfect' star Skylar Astin. In 2015, the production has returned with a fresh new cast filled with Broadway firsts. Nearly half of the cast is deaf or hard of hearing and one of the actors, Ali Stroker, is the first actor on Broadway to take the stage in a wheelchair. The Brooks Atkinson, the theater that 'Spring Awakening' is playing in, transformed the backstage area to be more accessible for a wheelchair specifically for Ali. Due to the lack of wheelchair performers until now, backstage areas in theaters did not have the need for accessibility. Deaf actors have been seen on Broadway before in the limited run 2003 revival of 'Big River,' but 'Spring Awakening' has gained significantly more critical acclaim. While some actors speak and use sign language simultaneously, other roles are shared by one deaf actor and one hearing actor. The hearing actor doubles as the voice and/or member of the band. The deaf community is among the last groups of people that would be seen enjoying a Broadway musical, for obvious reasons, but now they have the opportunity to enjoy something that was nearly exclusive to hearing people. Telling true tales is something that Broadway has begun to welcome much more of on stage, especially when the show has a story that has an immediate connection to the current society. Last season, Broadway brought 'Fun Home,' the story of a young girl discovering her sexuality for the first time, and now there's 'Allegiance.' This show tackles the message of race relations in America in the time of internment camps after the bombing at Pearl Harbor. In the 1940's, Japanese-Americans were seen as inferior and second-class citizens, just as people of Islamic faith are seen in today's cruel society. 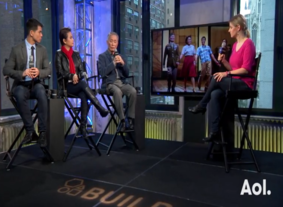 The three stars of 'Allegiance' came to AOL Build recently to discuss the impact the story has on Broadway audiences and what lessons are being learned in their show. 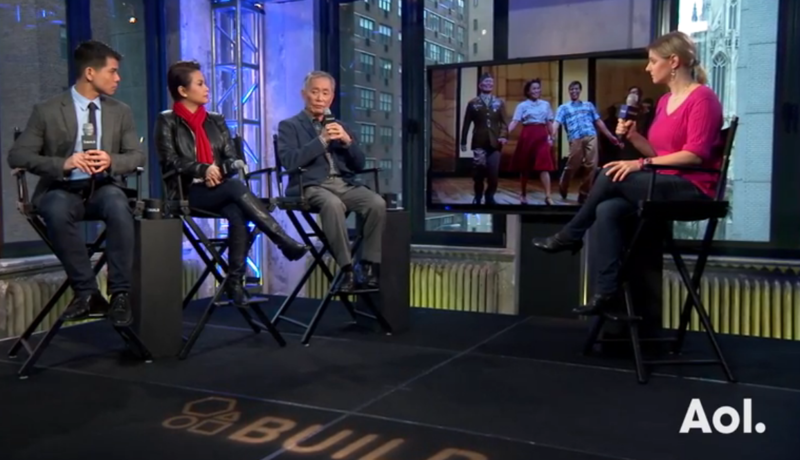 'Allegiance' is a personal story for George Takei, as the musical follows his family's real experiences during the war. Takei explains that "we sense the echo of 75 years ago here today" in terms of the parallels of how we treated Japanese-Americans then compared to how we treat Muslims now. Japanese-Americans were being blamed for what happened at Pearl Harbor and being demanded to be removed from the country, while Muslims in America are also having the blame put on them for the actions of ISIS and political candidates are calling for similar tactics to remove Muslims from the country all together. There is a common saying that describes this scenario that goes, "those who don't pay attention to history are destined to repeat it." While the story of 'Allegiance' isn't all dark and sad, it reminds the audience of where we have been as a nation and opens eyes up to where we are going. Representation is important in mediums like Broadway, especially because of the diverse backgrounds of the American people and those who come to visit New York City. We have finally come to a point in time where all races, genders and other backgrounds have the ability to find a place in theater, which is something to be celebrated and enjoyed.